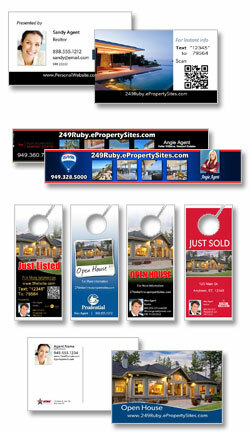 There are several great printing options for advertising your listings (and yourself!) that have most likely become a staple in your marketing strategy. Property flyers and "Just Listed" postcards are tried-and-true marketing methods that many agents embrace. However, there may be some options you haven't yet considered adding to your marketing repertoire. Here are a few property-specific printing ideas we love, along with some tips for integrating your online and print materials for a powerful, cohesive marketing strategy. Biz-prop cards are one of our very favorite ways to market! We love them because even though they're the size of a regular business card, they are a mighty little tool for agents. For one thing, it's a sleek and professional business card with your photo and contact information on one side. But with the other side dedicated to one of your listings, it also means you end up looking pretty darn awesome to your sellers. Sellers will love handing cards out to everyone they know, and we also recommend keeping a stack at your open houses. Rather than ending up in the recycling bin, these convenient little cards are great for interested buyers to hang on their fridge to remind them about the beautiful home they just toured. Water bottle labels are another wonderful open house tool. These handy labels are easy to attach to a bottle of water, and act as perfect gift for your open house visitors. Not only will they sincerely appreciate the refreshing beverage, but they'll walk away with information in hand about the listing and the clever listing agent. Door hangers are a really nice way to introduce yourself to the neighborhood, especially when you are using a nearby listing as an excuse to do so. Neighbors are always curious about the homes for sale in their area, and will love getting a sneak peek at the listing price and features of the home. This is also a good opportunity for you to invite them to an upcoming open house where they can meet you and hopefully turn into future clients! Sending out postcards announcing an open house is another good way to meet the neighbors. We always recommend inviting the neighborhood to a special showing 30 minutes prior to the official start of the open house. This makes them feel special and more inclined to attend (especially if you offer snacks!). Design your postcard to provide information about you and the listing and let them know it doubles as an exclusive invitation to the special showing. For information on bundling any of these materials with sign orders, or to learn how to connect these ordering options to your ePropertySites account, contact our sign shop to speak with our print specialists. Be sure to ask about the $39 New Listing Package!